When the first sneak peaks of Hot Rod in TF5 hit the internet around summer 2016, I was excited. Hot Rod/Rodimus Prime is one of my favorite Transformers characters and even though his design wasn't traditional, I thought he looked pretty cool. So when the TF5 movie toys began coming out, Hot Rod was exclusive to Walmart (like Stinger before). Though for whatever reason, waves past the initial push didn't come to stores in the standard time frame or not even at all. Hot Rod was available online, but not on shelves (except for a 3 step toy). Fortunately in the recent months he did appear at Ross stores and his deluxe figure has been making appearances at the stores in the recent weeks. So, you can get a Hot Rod and an ugly pair of Nike at the same place! Hot Rod is based on the Age of Extinction Lockdown deluxe mold with a new parts and color deco. This works really well and makes for a better Hot Rod than Lockdown oddly enough. It's a good toy mold with ample articulation and good use of color and sculpting. 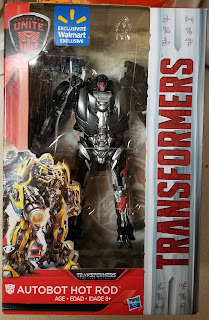 It wouldn't be mistaken for the more premium Studio Series figures, but does look really nice. If I had any complaints in this mold, it's that the joints on mine were a little too tight and I was worried I'd wrench a part off. 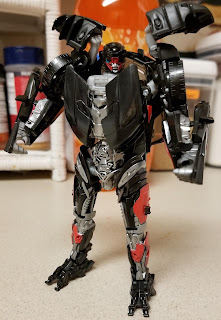 The only loose part was one of his weird shoulder pad thingies that came off way to easily. Fortunately it went right back into place, but not without getting cursed out for it's annoyance. I wish Hot Rod had an accessory. Maybe his time freezing gun from the movie, or a cool movie style Targetmaster. That'd be really neat actually. I know, I know, I can buy a gun on shapeways or something. But I bought the figure for 9$, spending 20$ plus shipping for a gun isn't exactly something I'd like to do. That'd be like paying 5$ for french fries to go with a 2$ burger. 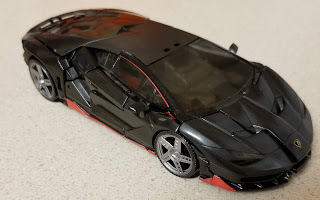 Speaking of expensive choices, Hot Rod's car mode is a Lamborghini Centenario. Which is a very fancy car that costs more than I can fathom. Seriously, I've never spent more than 25k on a car. I'm very simple. Seriously, what's making that car so fancy? Does it have cup holders that fit those really big drinks or something? Regardless of the pricey car, it's really cool looking. 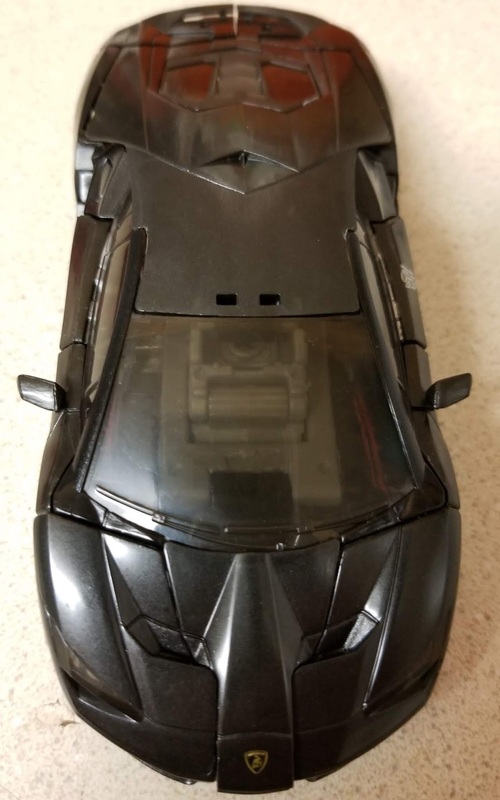 This is a car I could see a traditional Hot Rod turning into and a little eagle eyeing the car's details could show how a clever paint job could make him look even more G1. Transforming him, however, wasn't something I enjoyed. I don't hate it or anything, but I don't want to do it often. It's not overly hard, just fiddly enough to get everything to snap into place to be frustrating. One you do, it's in place though. 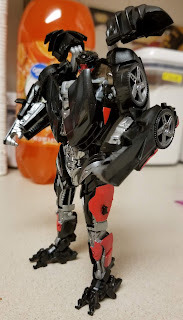 Just like going back to robot mode, just frustrating to get everything into place. Though considering the smooth looking car mode and solid robot, if that's the only complaint, then there's nothing major to complain about. Like if his name was Rodimus Major.